Boxedsearch.com Redirect is an infection that is likely to target Internet Explorer, Google Chrome, and Mozilla Firefox browsers. Once this browser hijacker slithers in, it might take over the homepage, as well as the default search provider to push you into using the search tool that, at the moment, does not work at all. In case the infection is installed along with an extension, it could also be represented via the New Tab page. Overall, regardless of how this hijacker is represented on your browser, we strongly advise deleting it right away. If you believe that this search tool is harmless, you should read this report to learn more about the risks that you might be facing by using it. If you want to remove Boxedsearch.com Redirect as soon as possible, please check out the instructions below. Hopefully, you will be able to clear your browsers and your operating system using them. 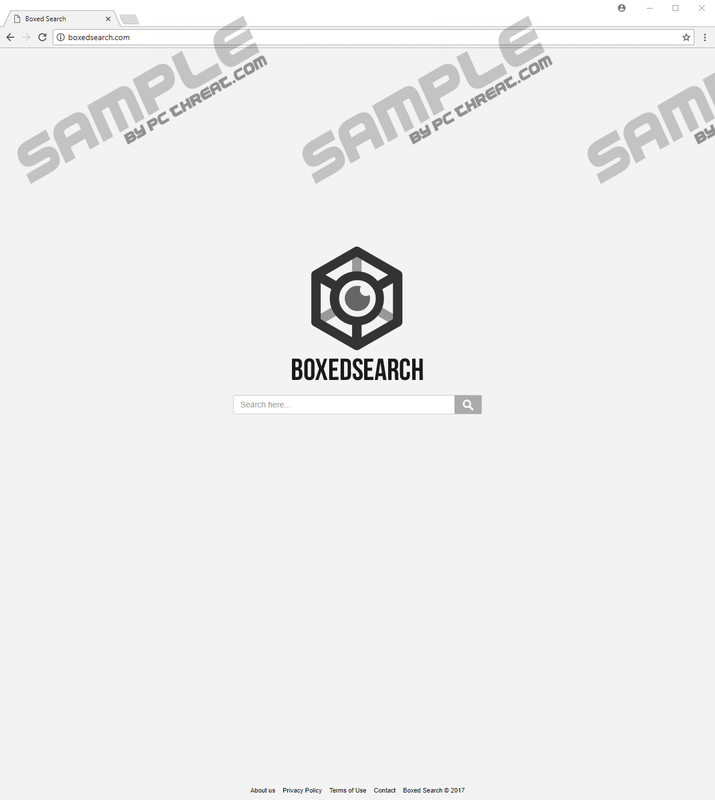 If Boxedsearch.com has taken over your browser, you need to think how this happened. Did you let it in yourself when installing third-party software? Or has it corrupted your browsers without your notice or permission? In either case, there is a good chance that other infections have invaded your operating system along with the redirector. Do not just assume that malware does not exist or that it is harmless. Instead, install and use a legitimate malware scanner to help you figure out the situation. Obviously, if malicious threats are detected, you need to delete them as soon as possible. If no other threats are found, you can focus on Boxedsearch.com Redirect, and this threat certainly deserves your attention. Have you used the search tool offered by it? If you have, you know that it does not work. Just like the suspicious Bonzersearch.com – whose removal we discussed quite recently – it does not seem to function as a search tool at all. If it did, we would not recommend trusting it anyway. Have you checked the Privacy at http://boxedsearch.com/privacy? If you have, you know that the search tool works with advertisers who can use it to display promotional links, as well as collect information. Due to this, it is not recommended that you use the search tool. If you do, you have to be careful about the sponsored links that might be added along with regular search results. Of course, none of this is likely to matter to you if the tool does not work in the first place. All in all, this proves that Boxedsearch.com Redirect is not that beneficial, and if you are thinking about letting it in, we suggest thinking again. The hijacker’s ability to redirect you to search-unrelated sites is one of the reasons we identify it as a redirector. You could also call it a redirector if you were redirected to Boxedsearch.com via a third-party search engine or any website. Needless to say, we do not advise trusting search engines, sites, or software that redirect to Boxedsearch.com. Instead, we advise scanning your operating system to see if you need to delete any malicious threats. If there are no threats directly responsible for Boxedsearch.com Redirect, you should be able to get rid of this hijacker by changing homepage and search provider settings. If you are blocked from changing these settings, check if you need to erase extensions or uninstall unwanted applications. Again, a legitimate malware scanner can help you identify these extensions and applications. The guide below shows how to change homepage and search provider settings. In case you face threats that you cannot delete yourself, installing a trustworthy anti-malware tool is the best option for you. As long as the tool you install is legitimate and up-to-date, it should have no trouble identifying and removing malware. Of course, if you need assistance deleting Boxedsearch.com Redirect, or you have questions regarding this threat, you can use the comments section below to communicate with our research team. Open the browser and tap keys Alt+F to open a menu. Select Settings and find the Search provider menu first. Find the unwanted provider, click the More actions button, and select Remove from list. Go back to the Settings menu and then move to On startup. Edit/Remove the unwanted startup option. Open the browser and tap keys Alt+T to access the Tools menu. Select Options and then click General in the menu on the left. Navigate to the Home Page section and overwrite the URL of the unwanted option. In the menu on the left click Search. Set the desired search provider and then Remove the hijacker. Select Internet options and then click the General tab. In the Home Page section overwrite the hijacker’s URL and then click OK. Tap Alt+T again and choose Manage Add-ons. Set the desired search provider, Remove the hijacker, and then click Close. Quick & tested solution for Boxedsearch.com Redirect removal.